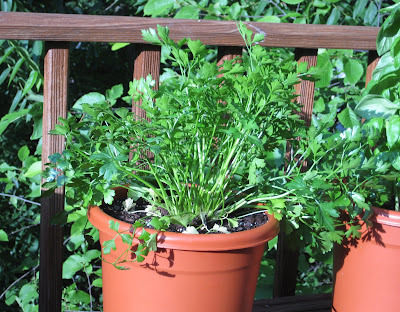 Every time we go out on the deck, we are amazed by well our herbs seem to be doing. I certainly don't want them to be limp or brown or withery, but if there's such a thing as doing too well, I think it's our herbs! We are pruning away (to keep them happy and healthy) and giving herbs to family, friends, and co-workers. First up, the mint. Last year it was kind of a letdown. I had read/heard so much about how mint thrives like a weed and will take over gardens and yards, but our pot of mint didn't seem very happy. It never took off and we never had as much as we would have liked. We did a little research and this year, we tried a new spot on the deck, one with more shade instead of constant sun. 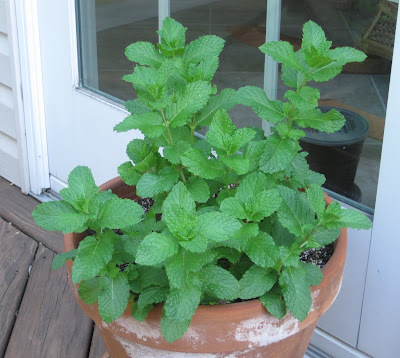 The mint is much, much happier. Here it is, freshly transplanted May 14: June 5: It had grown enough to allow us to snip off 3+ cups, so here's what it looked like after we snipped off a bunch (June 13): I had some concerns about it's ability to rebound. Had we taken too much too soon? 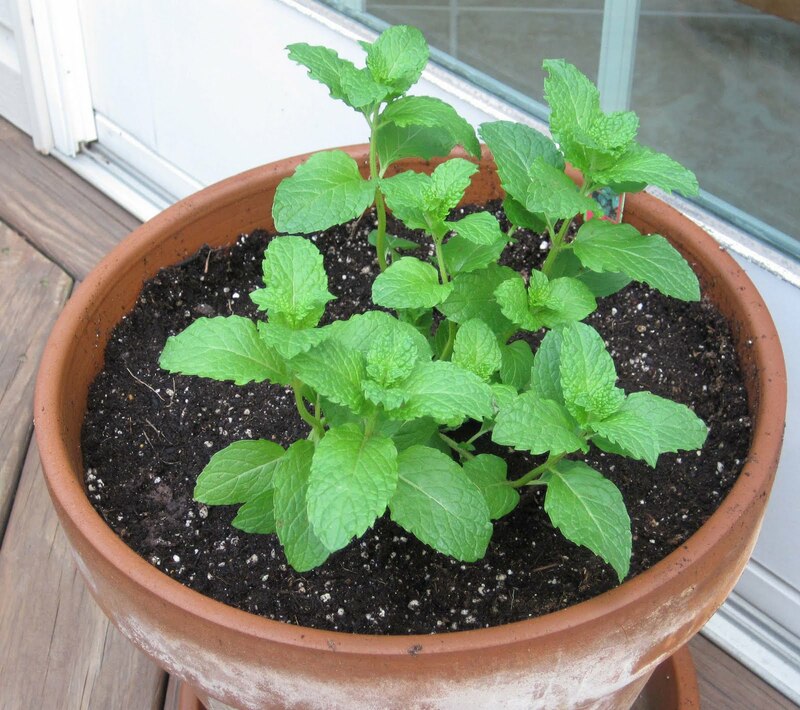 Here's the mint on June 26: Doing just fine! We got our parsley in the CSA. 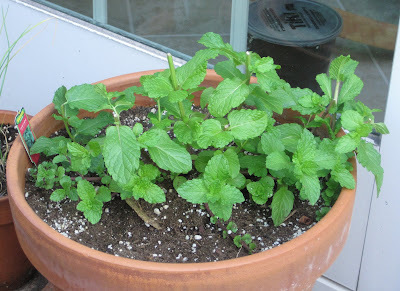 We transplanted it into a large pot on May 21: In mid-June we snipped off a bunch of it: Then it had an accident. I don't have any photos, but one day we looked out on the deck and saw it had toppled onto the deck from its perch on the wood bench. Sadly, it was in one of our clay pots and the pot busted into lots of pieces. The poor parsley looked like a murder victim. It's roots were all exposed, it was surrounded by broken pot, the green leaves were smushed up, and it just looked sad. We blame Randy Raccoon, who seems to be lurking about again, because it seems odd that the wind would knock off just one of the 4-5 pots on the bench, and especially a heavy clay pot instead of lighter plastic pot. SP rushed out to get a new pot and we performed an emergency transplant into a brand new, larger, plastic pot, and added some fresh dirt and some plant food. Here it is last Sunday: It's happy and healthy, If you look really close, you can sort of see where we snipped off a bunch, but overall, it's good. We also decided that maybe Randy isn't the attempted murderer. 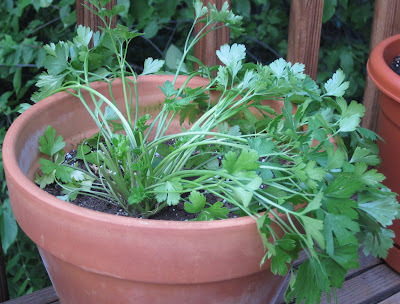 It could have been one of the stray cats or maybe a squirrel, though we doubt a squirrel is strong enough to topple a clay pot of parsley. Then there's the basil. We planted some seeds in tiny, wee pots Easter weekend. Then in mid-May we transplanted the wee basil into larger pots (we have 3 big pots of basil). 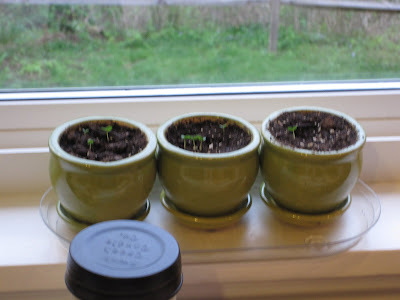 The largest pot has the 4 wee sprouts that have blossomed into mini basil trees: The chives looked a little sad when we transplanted them from their store container into one of our pots. Limp and sad, and then they started to turn a bit brown. We moved them to the side of the deck where the mint is, and the decreased sun/increased shade seems to be helping them: We've only had the sage for a little while. We got it in the CSA. It's next to the chives on the deck and seems to like that spot: The rosemary is thriving: And the thyme, too. At first I thought the thyme looked pretty scraggly and like it wouldn't last long. Then I thought it was getting a little brown. But now it's really taking off. There's only so much food 2 people can eat, and a little fresh herb goes a long way. We've used our rosemary in lamb & pork marinades, stuffed it in chicken, and roasted it with potatoes. The thyme got used in scalloped potatoes and roast chicken. The basil gets used a lot, mostly in salads, on tomatoes with balsamic syrup, on sandwiches, in salad dressing. 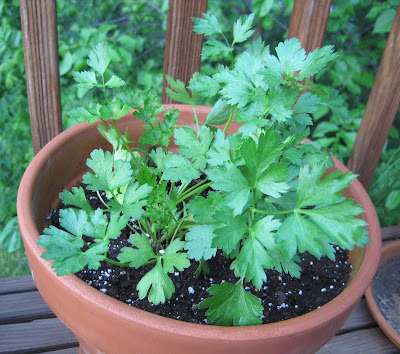 We haven't made a potato salad yet, but a lot of parsley will get used in that. The chives and basil are tasty in eggs. And the mint - oh that mint chocolate chip ice cream was so good! Plus mint simple syrup for my iced tea. We find the sage hardest to use, other than in roast chicken, but hopefully we'll be able to preserve some for the winter months and use it for Thanksgiving turkey and stuffing. But more than anything, I like the sense of nurturing and growing these 'babies' of ours, and the sense of calm and peace they give me when I am on the deck. There are a lot of trees around the deck, we are surrounded by 9 pots of herbs (we have multiple pots of basil) and 2 pots of petunias, and it's just so relaxing to be so surrounded by nature and to inhale all the wonderful smells. 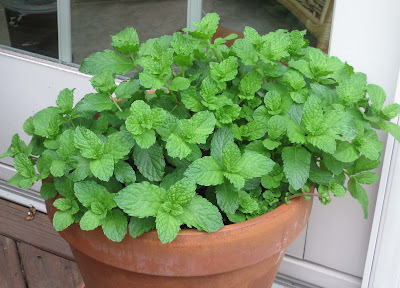 We seem to have the hang of herbs, maybe next year we'll tackle trying to grow tomatoes or cucumbers, although I still have my doubts of any success because of all the wildlife (groundhogs, deer, bunnies, raccoons, squirrels). We'd have to really devote some time not just to planting and nurturing the veggies but to creating some kind of barrier around the garden so that nothing can munch on our goodies. I gave them a pretty serious pruning when I was over today to water them, so it'll be interesting for me to see just how much they've grown when I'm over again on Monday. I was definitely amused when I saw just how huge basically all of them were - not that my herbs are doing badly, but yours are completely dwarfing all of mine, with the sole exception of the chives - mine are currently a bit healthier than yours, and I suppose our parsley plants are at least pretty comparable (though yours is still larger than mine is, despite the spill yours took ;) ).